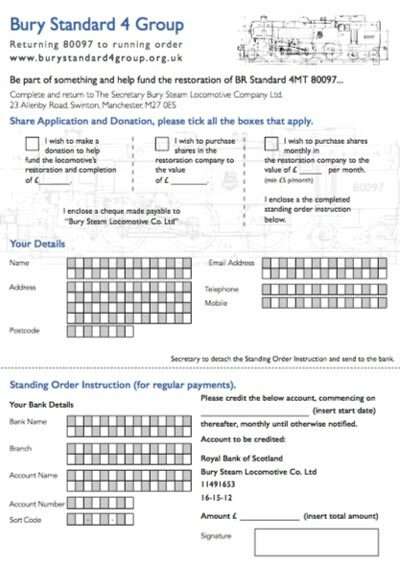 Shares can be purchased in the Bury Steam locomotive Co. Ltd., which owns the Standard 4 80097 and the Ivatt 46428 locos. This will help to fund the restorations and the operating costs once restored. Shares are £1 each and a minimum holding of 50 shares is required. Bury Steam Locomotive Company Limited. As a bank transfer reference please enter code S and your full name. Option 2 - Visit the Group's fund raising shop coach at the end of platform 2 at the East Lancashire Railway's Bury, (Bolton Street) station. Forms are available there and payment can be made by cheque or cash. If you would like to volunteer to help with the restoration of our engines and rolling stock in our workshop, then you also need to become a member of The East Lancashire Railway Preservation Society (ELRPS). (This is to comply with Health & Safety Requirements).